As a former apprentice from 1980 and 1981, it was exhilarating to return to Williams College for the Williamstown Theatre Festival’s world premier of William Inge’s "Off the Main Road." Kudos to WTF for commissioning a piece that was long lost, then reintroduced by the Inge Estate. This is the kind of mission WTF has always been known for -- work that makes actors want to get their hands dirty, so to speak. Many WTF productions have taken the next big step, over the New York border, to Broadway, and "Main Road" is one that I hope makes it. The world should see these artists. The play, the actors, and the technical aspects are Broadway ready. Chills and tears welled up in me as I parked in the garage, then came into the lobby. My formative years in theatre were filled with right out of college experiences with all the hopes and dreams in the world to work alongside so many brilliant actors. While at the play this week, I happened to sit next to an apprentice the same age as I was when I first learned from this rich and electrifying group -- the same group for him, only decades later. I asked the young apprentice if they were still allowed to perform a "line rehearsal" with the main stage actors. He answered, yes and that he done so. He has no idea that his summer at WTF will be incredibly invaluable; a year's worth of acting classes in an hour or so. So glad some things hadn't changed. The play's three key characters are a mother, daughter and grandmother. 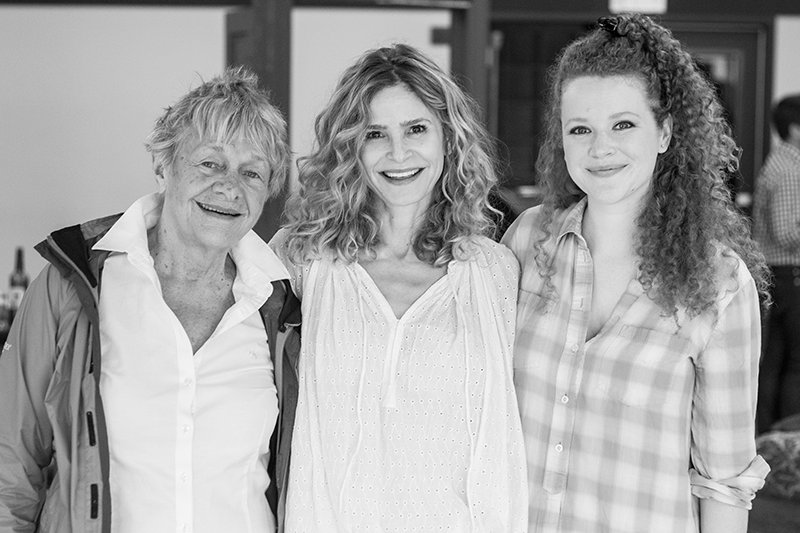 Golden Globe and Emmy Award-winner Kyra Sedgwick makes her WTF debut as the elegant but emotionally fragile Faye Garrit. Her character seeks refuge from her husband by checking into a run-down resort on the outskirts of St. Louis. With her is her 17-year-old daughter portrayed by Mary Wiseman. Faye’s mother is acted by the formidable Estelle Parsons, an Academy Award and Lifetime Achievement winner and a frequent visitor to WTF's stage. Director Evan Cabnet has the skill of perfectly casting this gripping and powerful drama. He proves which Inge’s legacy of “penning rich, emotionally hard-hitting stories populated by complicated and truthful, human characters”. The crux of the play is the root of the cycle, a cause and effect of three generations and their affects on each other. Personal, political, and sexual awakenings connect the mother and daughter with heartbreaking clarity. I walked out of the theatre stunned with much to think about -- my own life and family members, not to mention memories of my apprenticeship at this superior theatre high on the gorgeous mountains of Williamstown. WTF was brilliant theatre then, and it is now. A Day in Lenox. . .